Offer unspoken words of comfort, hope and peace. 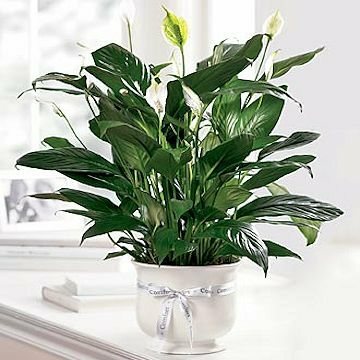 Our creamy white ceramic planter holds an elegant peace lily plant. Planter is simply enriched by a white ribbon bow bearing words of "comfort". Dark green leaves offer a calm background for the white candle-like blooms of this easy to care for plant. Send as a tribute, and a silent expression of your sympathies. If delivering to a service, please include the name of the Funeral Home when inputting your ship to information at checkout. Please include the name of the Funeral Home when inputting your ship to information at checkout.